We’re really excited about showcasing our range of personalised wooden usb sticks. Each of our wooden designs can be customised according to your needs, and are stylish and eco-friendly to boot. The combination of practicality and stylish sculpted wood makes for an elegant keepsake, with added personalisation options. 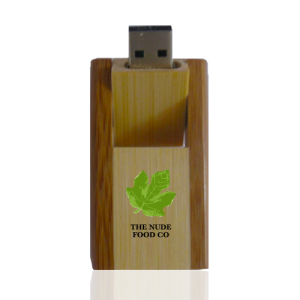 Whether you’re looking for a simple logo, text, or the neutral plain wood patterning complete with natural grain, our USB’s can be tailored to suit your needs. There’s something novel about pocket USB drives, people tend to really like having one or two of these things for safe keeping – the more unusual the better. They have created unprecedented accessibility and are truly as universal as their name implies. Despite evolving into USB 2.0 and USB 3.0 the underlying universal architecture remains. Forward thinking business’s and technology developers implement USB functionality into their projects as standard, and woe betide those who aren’t prepared for USB integration in the modern world! In addition to this, their practical value can’t be understated, of all the promotional materials you can commission to get consumers to engage with your brand, USB’s tend to be among the most well received, with people hanging onto them permanently thanks to their usefulness.